BMH readers you are in for a treat. The next few days there will be an influx of Hungry Games posts and they are focused on everything amazing about summer, including restaurants in Colorado, grilling, marinating and outdoor brunches. My sister, Dubs, recently got married in Steamboat Springs, Colorado—my favorite place in the whole entire world. This small mountain town has a few good restaurants, but dining isn’t really what lures people there (skiing, boarding, biking, hiking, tubing, hot springs, rodeo, hot air balloon rides…). I flew out to Boat a day after my mom and sister arrived. While I was literally sprinting across the Denver airport to make my connection (yay for 15 minute layovers in massive airports), my mom and sister were discovering a fantastic new restaurant in Steamboat—The Laundry, located at 127 Eleventh Street, about a block off of Lincoln Avenue. One look at the menu posted in the window and their mouths started watering. They decided we would eat there for dinner, and Joey Lawrence WOAH, I’m glad we did. The restaurant, located in the historic building that housed the Steamboat Laundry from 1910 to 1977, retains a great rustic ambience. 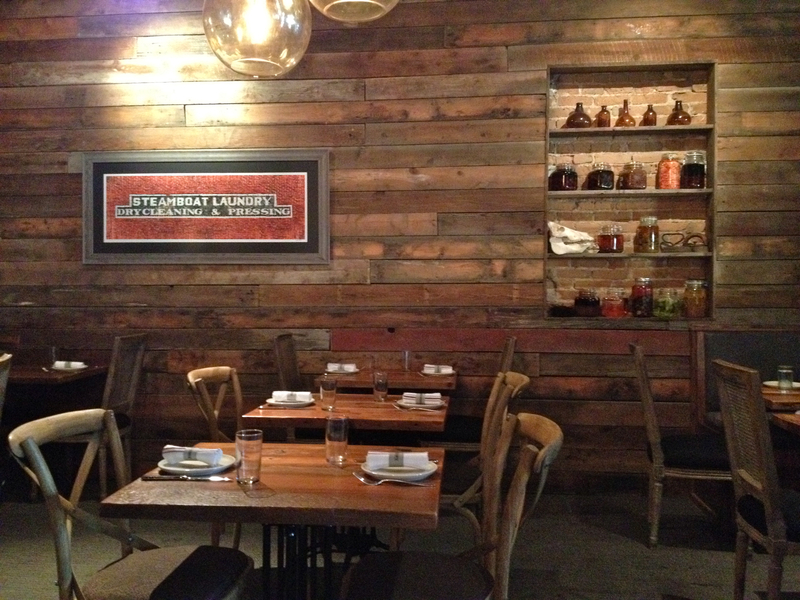 The wooden walls, exposed brick, and shelves with jars and other artifacts provide a cool, American cowboy feeling to the space. 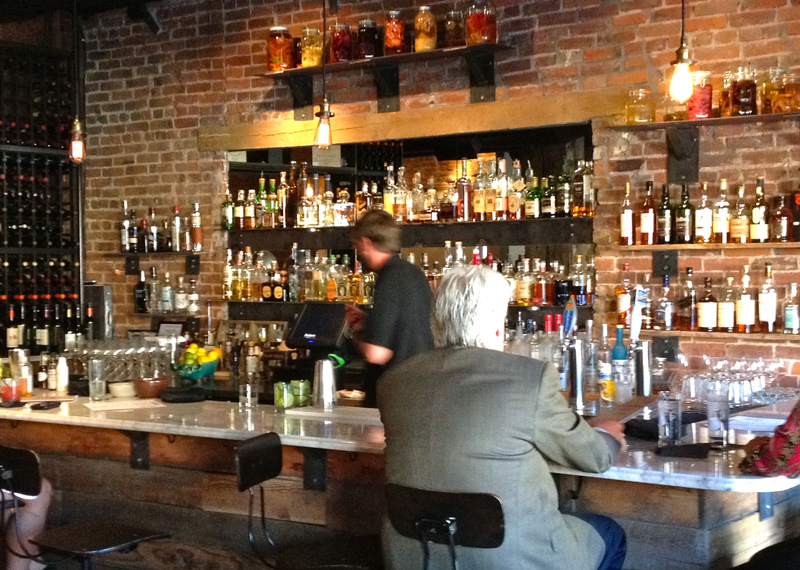 The bar serves up whiskeys, tequilas, and house infused vodkas. 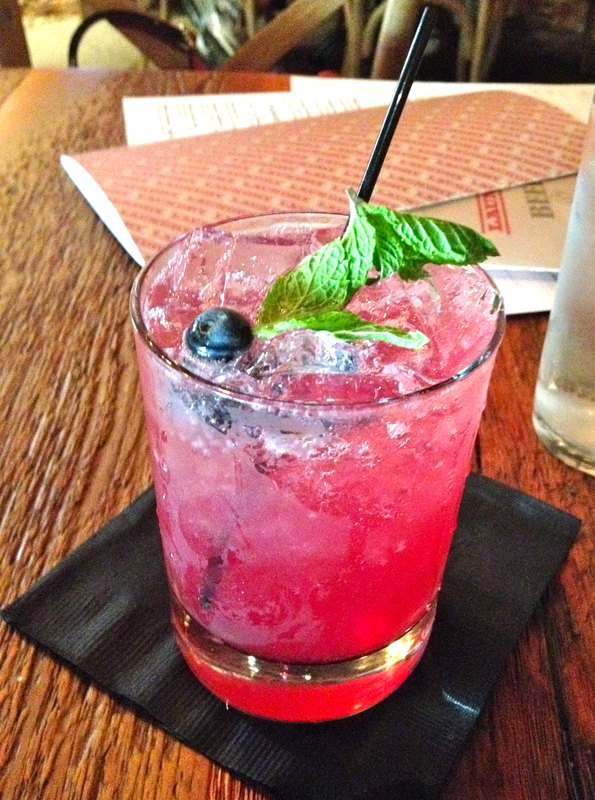 We tried the cocktail special of the night, a blueberry infused rum with mint and sparkling white wine—refreshing and delicious! Our waitress, an Australian Julie Andrews (another sign that the restaurant was special), helped us decide amongst the tantalizing choices of small plates on the menu. 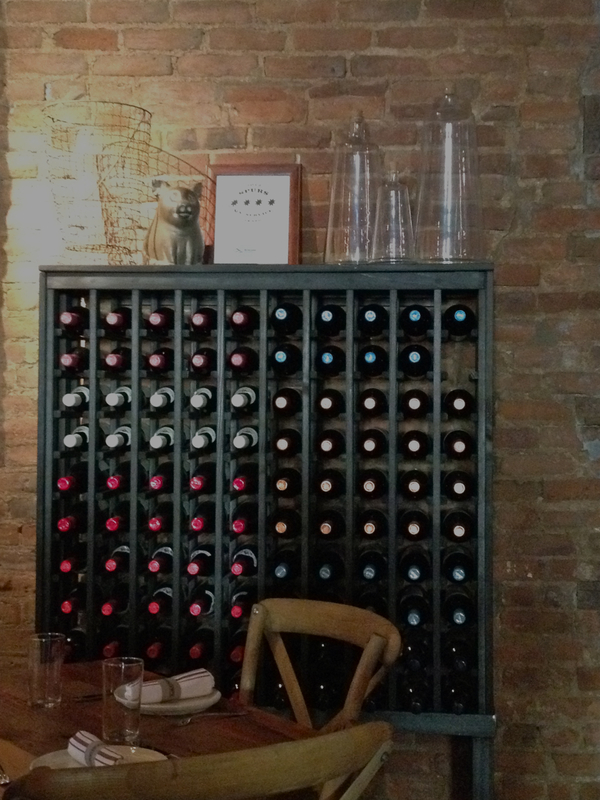 The menu is designed for ordering several small plates to share. 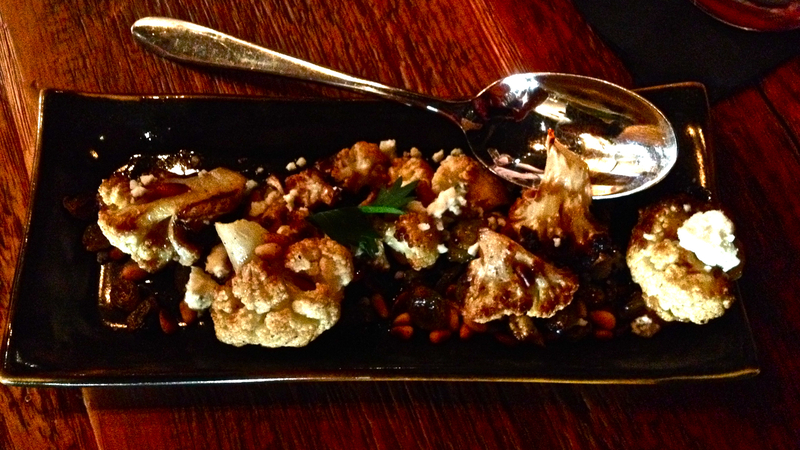 We started with the Roasted Cauliflower ($4). Served with gorgonzola vinaigrette, pine nuts, and golden raisins, this dish was a beautiful blend of flavors. 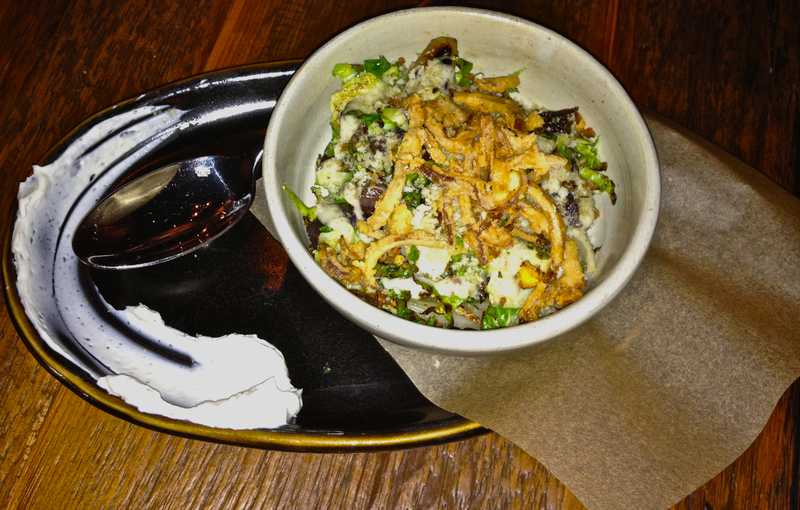 Next came the Brussel Sprout Hash ($7). The menu described it as roasted veggies, crispy onions, and bacon crumbs. It came with a bit of goat cheese and was another truly delicious dish. The recipe was printed in a local magazine, so I included it at the end of this post. Then we ordered the lobster fritters, a special for the night. 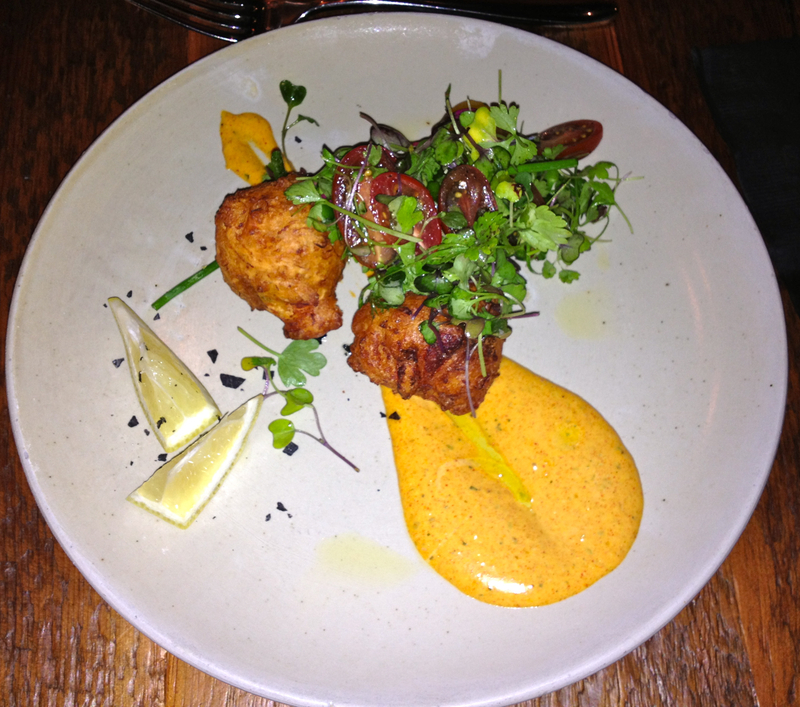 The fritters looked beautiful and were served with a nice, spicy sauce. I enjoyed them, because let’s face it, most fried foods are enjoyable. However, they didn’t really knock it out of the park for me. The flavor of the lobster got lost in the flavors of the fried cornmeal. Next to come out was the Rock Shrimp Pow Pow ($9), which had come highly recommended by Australian Julie Andrews. She was right! The crispy shrimp were served with a fine powdered horseradish for dipping and asian pear kimchee. It was an amazing combination of textures, temperatures, and flavors—hot, juicy shrimp coated in a crispy fried batter; powdery horseradish, which is something I’ve never experienced before; and sweet but spicy, cold kimchee. Mind blown! But, the real show stealer was the Lamb ($12). 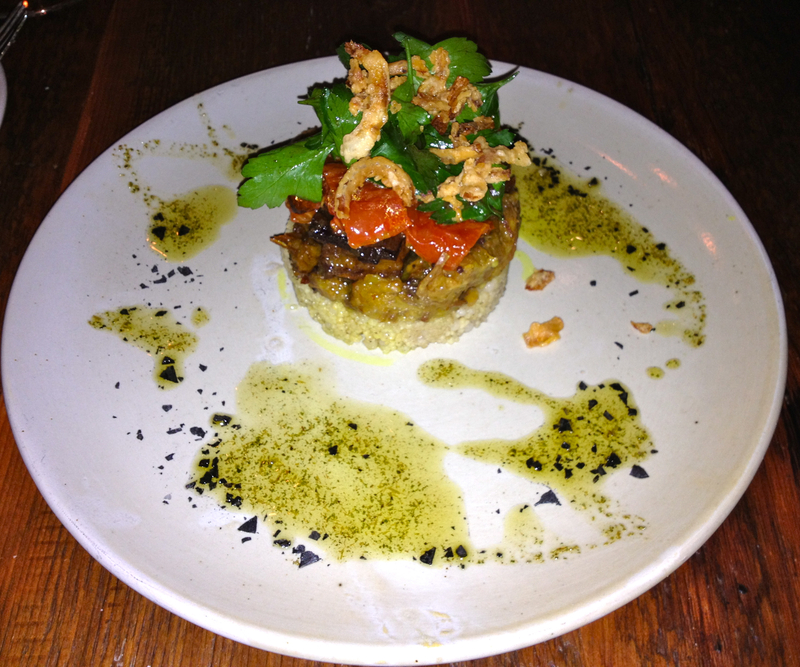 The description on the menu read ras al hanout (I don’t know what that means), cous cous, roasted tomato. Not only was the plate beautiful to look at, but the tender pieces of lamb had a smokiness to the flavor that added an unexpected layer of complexity to each delightful bite. It was so good, we asked the chef to come out so we could talk about it. We’re not the type of people who ask to speak to the chef, ever. 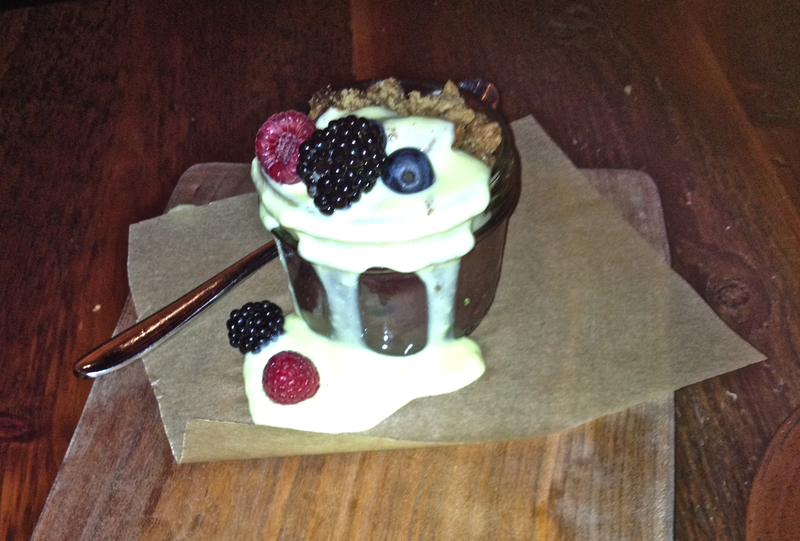 After, such a lovely meal, we had to end with dessert. And, of course, upon viewing the dessert menu, we couldn’t pick just one. So, we ordered the Rhubarb Berry Crumble, carr valley blue cheese, crème anglaise, and the Palisades Panna Cotta, peach, berries, cherries, vanilla (both $8). I’ll just say, YUM! Peel and cut squash and potatoes into 1 inch cubes. Coat them in olive oil, salt, and pepper and place on sheet tray. Roast at 400 until edges are brown and veggies are softened. Cool and set aside. Cut brussel sprouts thin and set aside. Dice onion into 1 inch dice. Put olive oil into hot skillet and caramelize the onions until brown and set aside. Add 2 tablespoons olive oil and roasted root veggies, onions, brussel sprouts, and a pinch of fresh garlic and oregano. Sauté until brussel sprouts start to brown. Put mixture into a bowl and drizzle with mustard vinaigrette (recipe follows). Top with bread crumbs, chopped bacon and fried onions. Combine first 3 ingredients in a blender, then add honey. Slowly drizzle in ½ cup of olive oil and 1 ½ cups canola oil. My name is Miriam and I the assistant to Rex Brice, the owner of Laundry here in Steamboat Springs. 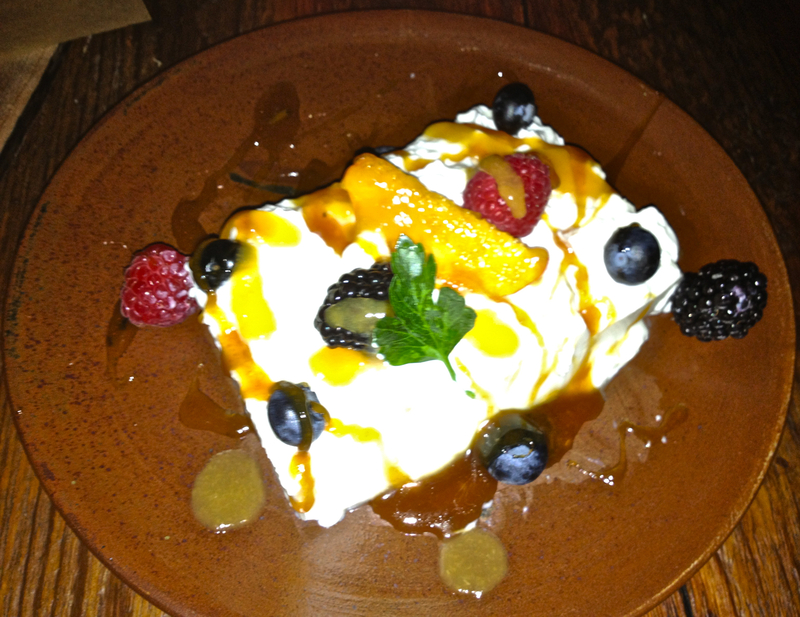 Thank you so much for the wonderful blog about the restaurant, I wish I had found it earlier. Would it be possible to get your permission to put this onto the Laundry website? Maybe have a hyperlink so our website guest could click on it and it would bring up the article? Please let me know and thank you again for your kind words! Hope you can get back to Steamboat and visit us again!